Pirscilla Murray with personal style coach Tess Purcell, owner of 'Style 'N Mind' of Ennis. Photo: Clare O’Regan. Pirscilla Murray of Galway was named the best makeover at Make A Star 2008 which took place in the Radisson SAS Hotel on Sunday last. At the event, 18 women and one brave man who each raised €1,000 for Cope received a full hair, beauty, and fashion makeover from some of Ireland’s top stylists. Pirscilla’s personal style coach was Tess Purcell of Style ‘N Mind, hair was by Laura Devlin of Fringe Benefits, make-up by Marian Naughtan also of Fringe Benefits, and outfit supplied by Marian’s. 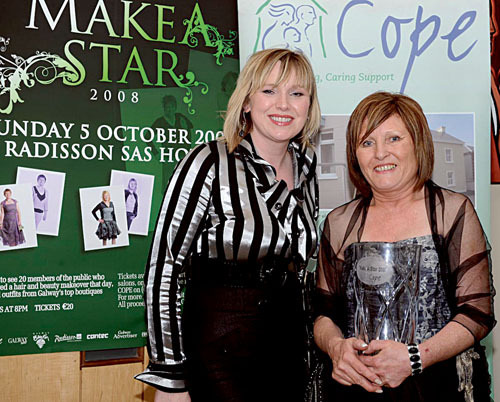 “’Make A Star is a great event and the makeovers performed by the stylists were amazing,” said Órla Ó Regan of Cope. “Each of the 19 women looked fantastic, and the atmosphere at the event was exciting as everyone revealed their new looks. Jimmy Norman of Galway Bay FM was brilliant as our MC and the support for the work that Cope does in our community was overwhelming.